A few years back, Lost Boy and I had a discussion about what Christmas traditions we wanted to have in our family. Lost Boy's family usually goes to a tree farm and cuts down a very tall tree, but I had never done that. The first Christmas we had 2Flowers we went to a tree farm, and it was fun, but Lost Boy has an adventurous spirit that really enjoys the backwoods and he wanted to take the tradition a step further. 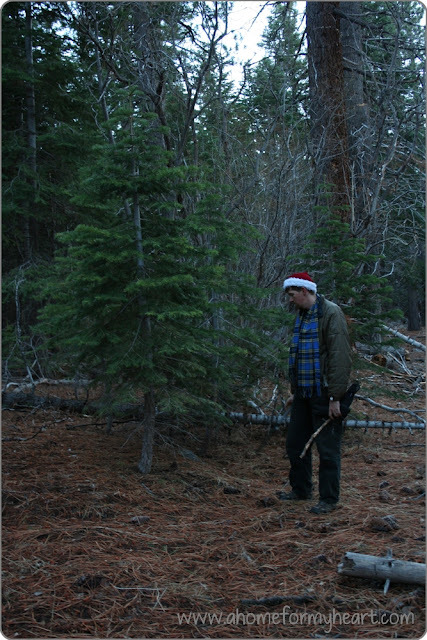 So we started The Wild Christmas Tree Hunt. Last year we cut down a tree in the Plumas National Forest. We had to make two trips because the first day we went we got stuck in a little valley because of icy roads and the priority became getting out instead of finding a tree. We learned a lot last year (take a truck with 4-wheel drive, or double check that the right size chains are in the car/truck you are borrowing, and remember that even 4-wheel drive should avoid certain conditions!) and were all geared up to go again this year. 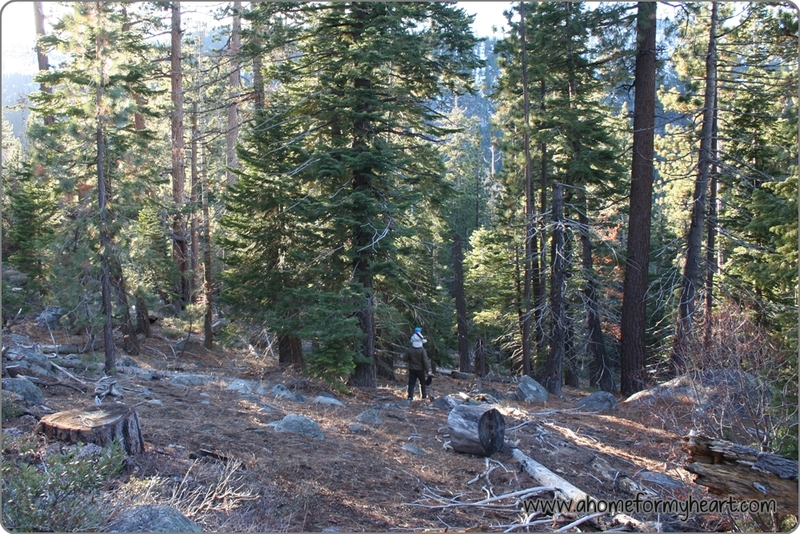 When we went to the Plumas Nat'l Forest there were miles and miles of forest and not very many people. We were about five miles from a tiny town that closed down by six pm when we got stuck last year. And there was no residential areas, it was all sparsely distributed cabins. This year, we drove for maybe 20 minutes and pulled off onto a little side road marked on the map. 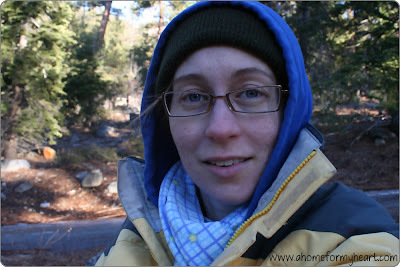 There were cars parked near the side road, and we saw several other cars and people. We went down one switchback, went over some ice, saw more ice, and turned back. "We learned our lesson last year," said Lost Boy. So we parked by the highway and walked down the side road a little ways. ... Actually, it was a long ways (for me). At one point Lost Boy had me sit down on a rock while he and 2Flowers went down the hill to look for trees. 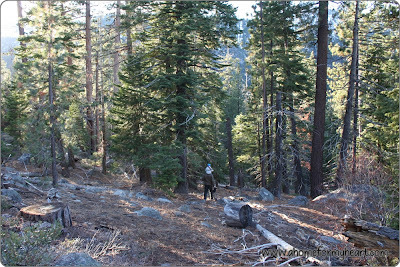 There wasn't a lot of selection (especially compared to the Plumas Nat'l Forest). They came back a little while later and Lost Boy said, "I want to look on the other side of the highway... I don't want to, but I think I should scout ahead." I assured him that was fine with me. There was no way I could get back up the hill very fast. 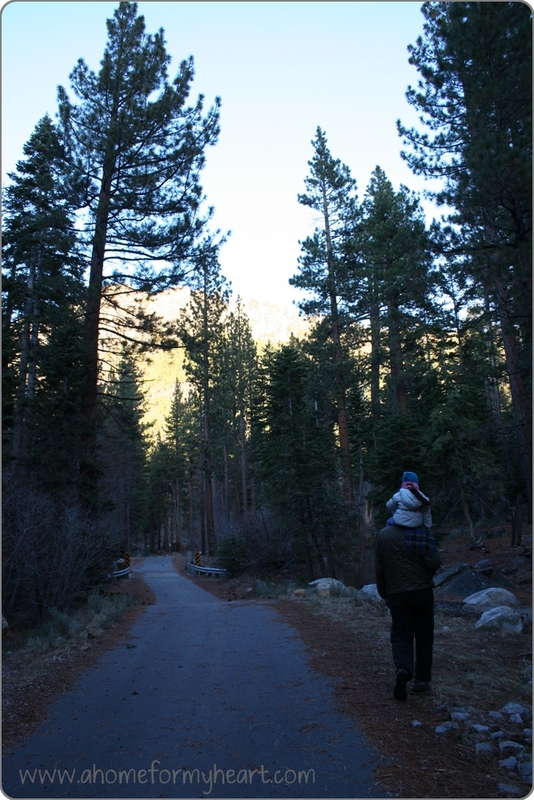 If we wanted to find a tree before dark, he needed to go at his normal long-legged speed, not his pregnant wife's speed. Going down the hill to look for trees. Me sitting on a rock at the top of the hill. 2Flowers and I meandered back up the hill. It was twice as far as I'd remembered. 2Flowers found a stick and poked at things with it. Lost Boy and I had been expecting lots of snow on the ground, but there was hardly any. When I found a patch of snow I encouraged 2Flowers to come and look at it. 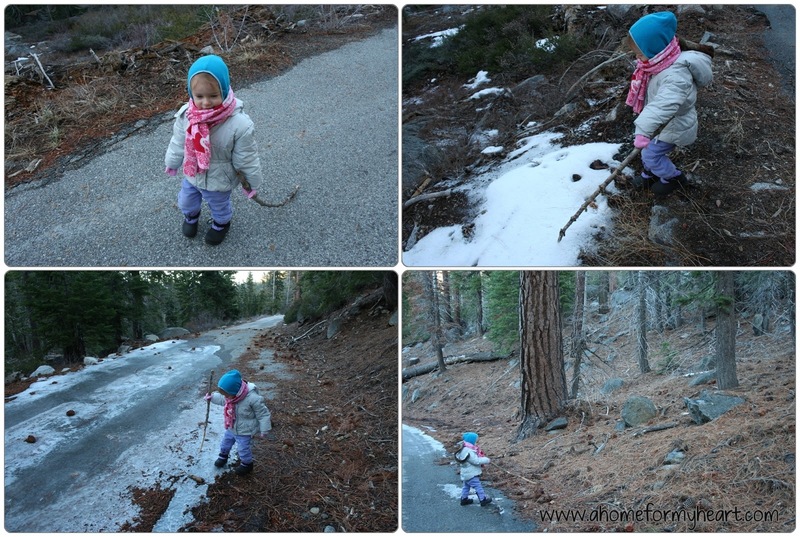 She told me she didn't like it, but she did like the ice and spent a lot of time stepping on and poking the brittle edges of it. 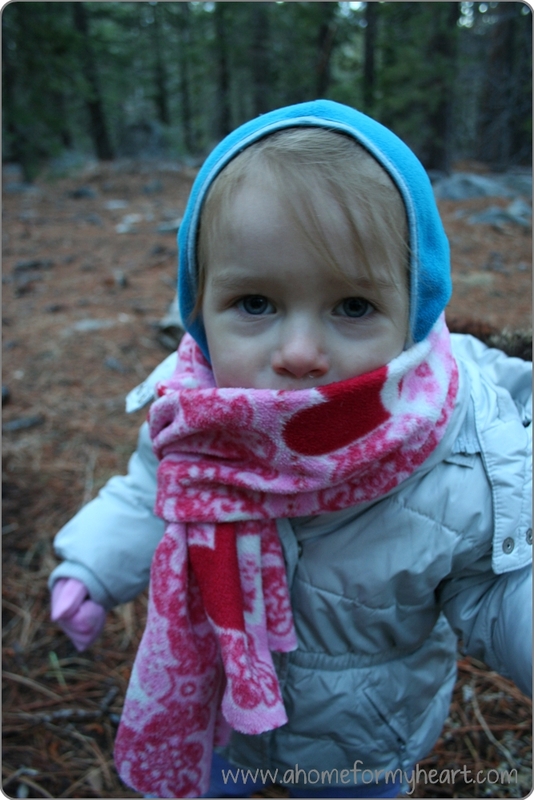 She shoveled some pine needles and was generally happy to be exploring the forest (except we were still on a paved road, so it wasn't the backwoods by any means). Lost Boy came and got us. We hadn't even made it back to the highway! 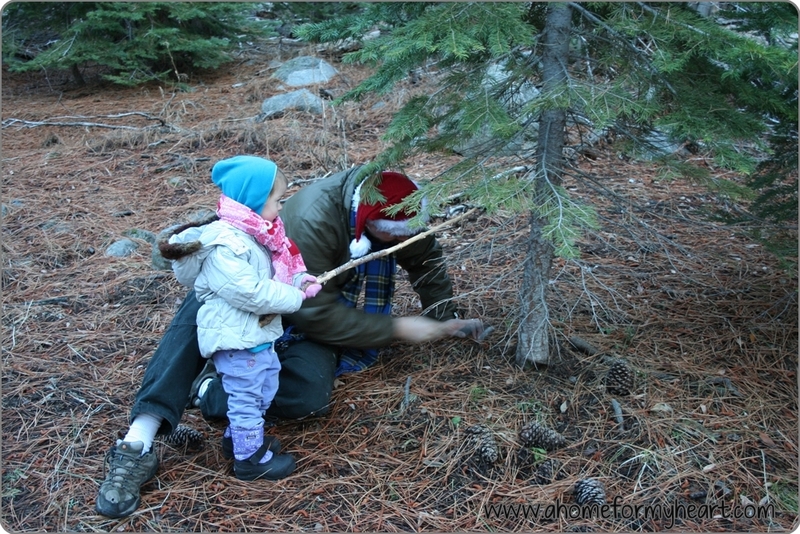 He had found two trees that he liked and he took us to see them. He preferred the second tree, and I thought it was very nice, too. I discovered that it is difficult to be picky when there isn't a lot of selection and you can't move around the forest fast enough to find the trees that are actually the right size. But the trees that Lost Boy found were very much our style and quite lovely. 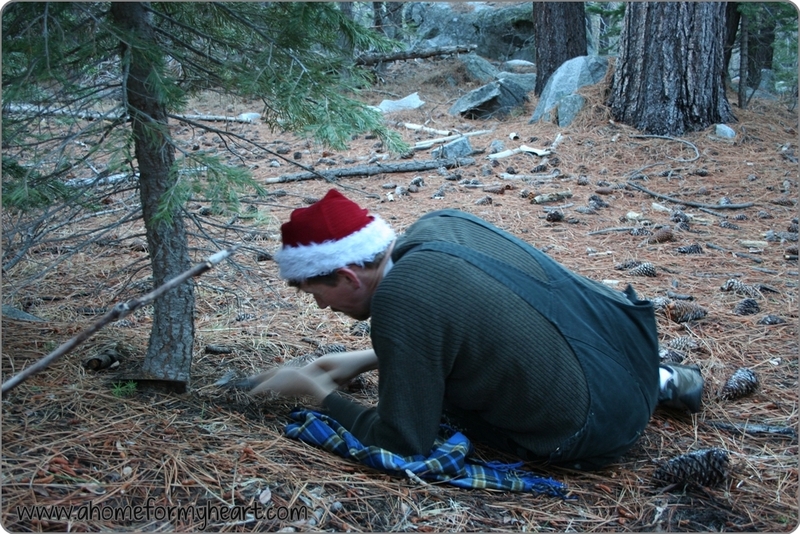 Last year, Lost Boy handed me the saw and I got to help cut down the tree. Not that I made much difference, I don't think I made it through a centimeter of the trunk! This year I sat on a rock while Lost Boy started to cut down our tree. Eventually he had me lean on it so that the cut would stay open and allow him to make better progress. 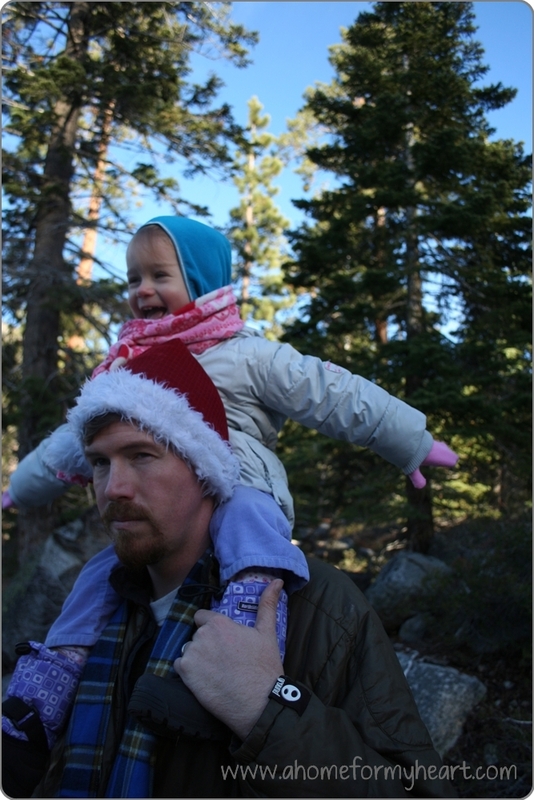 At first I was a little worried that I, with my weight and balance off-center, would go down with the tree when it fell. But I didn't, and it was kind of neat to feel the tree leaning more and more, and then to feel it leave my hand and tumble the rest of the way down. There was no shout of "Timber!" or huge crash, just a gentle tumble. Cutting at ground level to prevent trip hazards. 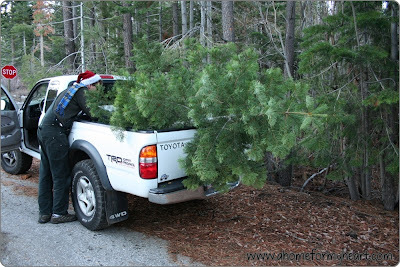 Loading the tree into the truck. The tree started out about twelve feet tall, but Lost Boy took several inches off the bottom before he put it in the truck. He took off several more inches when he brought it into the house. Now the tree is just tall enough to brush the ceiling. 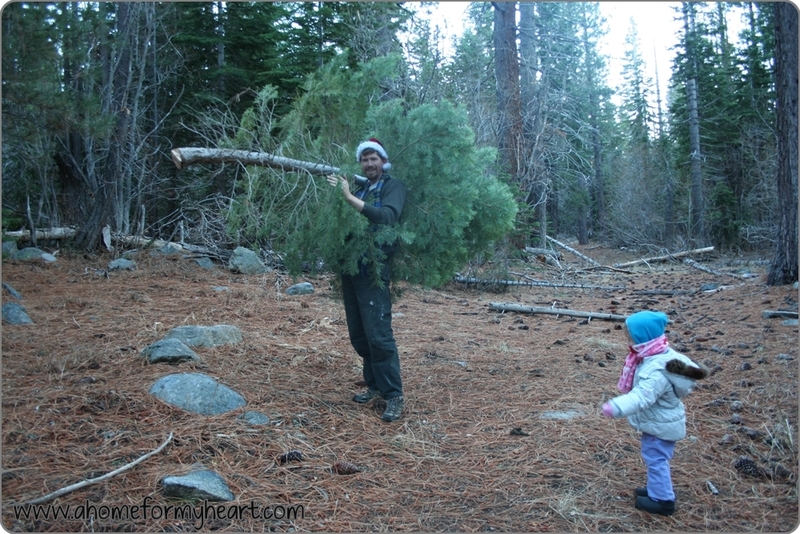 The lovely thing about cutting down your own tree is that a five foot tree costs just the same as an eight or twelve foot tree. The permit is $10 and you can cut down any tree that has a trunk circumference of less than six inches. So instead of paying $30 or $40 at a lot or farm, we payed $10 and had money for some hot chocolate and chicken soup on our way back through town. Lost Boy pointed out that the gas money for the round trip was about $40, so there is no savings there. But I think that the memories, the stories, and the time to be together and actually have a conversation is worth it. What a fun tradition! I bet your kids will think back on it quite fondly!